Swagath Grand Indian Restaurant & Bar uses their own specialised couriers to deliver their food. Cauliflower fried and tossed with special manchurian ingredients. Cauliflower dumplings cooked with Indian chilli style. Cauliflower dumplings cooked in Indian 65 style. Cauliflower with ginger, yoghurt, cashew paste and a splash of lemon juice. Spicy marinated chicken wings in a "lollipop" shape. Chicken cubes dipped in a flavour-rich batter of grain flour, fried crisp. Fried chicken balls cooked in a spicy sauce batter. Chicken cooked in Indian 65 style. Delicious chicken cooked with chilli sauce. Five spice coated boneless pieces of chicken stir fried with onions, ginger, garlic and chillies. Chicken cooked with ginger, yoghurt, cashew paste and a splash of lemon juice. Grated mixed vegetables deep fried into balls and then served in a special manchurian ingredients. Made with mixed vegetables dumplings and flavoured with vinegar, soy sauce and chilli sauce. Batter fried paneer Indian cottage cheese, tossed in chilli. Chicken strips fried and tossed with special sauce and ingredients. Juicy fish fillets are coated in a spicy batter and fried till a golden perfection. Fish cooked with ginger yoghurt, cashew paste and a splash of lemon juice. Prawns cooked with 65 Indian & Chinese spices. Prawns fried and tossed with ginger, cashew paste and a splash of lemon juice. Prawns batter fried and doused in a spicy-tangy sauce. Prawns fried with special gramflour batter till golden perfection. Boneless chicken marinated in spices and yoghurt and baked in a clay oven. Boneless chicken marinated in spices and cooked along with cheese, creme in malai style. Boneless fish marinated in spices and yoghurt and cooked in clay oven. Whole chicken marinated in yoghurt and seasoned with the spice mixture tandoori masala. South Indian chicken curry cooked in tadka style. Chicken cooked along with spinach gravy and cream. Boneless chicken cooked with hot spices along with capsicum and onion. Chicken cooked in onion and cashew gravy with freshly ground spices and capsicum. 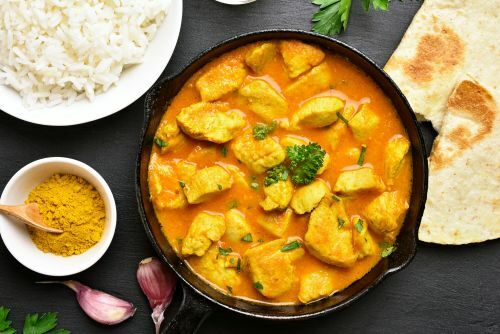 Chicken cooked in traditional Madras curry, flavoured with fresh curry leaves, mustard seeds and coconut. Boneless chicken cooked with spices in an almond sauce and garnished with roasted almonds. Chicken boneless cooked in tandoor simmered in rich sauce and finished with cashew and cream. Goat or lamb cooked in traditional Indian style. Goat or lamb cooked with cashew nuts and cream. Goat cooked in cashew nut paste along with onion and capsicum. Goat cooked with creamy spinach sauce and cream. Indian cottage cheese cooked in butter spices and creamy gravy. Cheese and cashed dumpling cooked along with onion and cashewnut paste. Cheese and cashew dumplings cooked along with spinach sauce. Lentils flavoured with freshly ground spices and sauteed in cream. Slices of paneer tikka cooked in fresh tomato based sauce and flavoured with ginger and chillies. Indian cottage cheese cooked in butter sauce and cream. Cheese and cashew dumplings cooked in a tomato based gravy. Seasonal veggies cooked in a spiced creamy tomato based sauce. The cakes are made by streaming a batter consisiting of fermented black lentils and rice. Deep fried lentil dumplings with spices. Deep fried lentil dumplings soaked in thick lentil dal soup. Idly topped with ghee and coarse powder of ground dry spices. Idly topped with butter and peanut chutney. Combination of Idly and Vada. Combination of Idly and Vada soaked in sambar. Basmati rice cooked with peas, herbs and garnish with fried onions. Basmati rice cooked with cashew nuts. Unforgettable taste of fresh vegetables, herbs cooked along with basmati rice. 65 Style biryani with cauliflower. 65 style biryani with mixed vegetable dumplings. Classic vegetable dum biryani cooked along with Indian cottage cheese. Classic dish of curried boiled egg in basmati rice. World famous "Hyderabadi Biryani" chicken marinate with special spices, yoghurt and cooked between layered aromatic basmati rice. Classic Hyderabadi goat dum biryani. Classic dish of curried fish in basmati rice. 65 style biryani with boneless fish. 65 style biryani with fried egg . Classic Hyberabadi Mughlai dish of special chicken 65. Classic Hyderabadi Mughlai dish of special fried chicken. Authentic Indian dish of spiced chicken mince cooked in flavoured rice. Classic dum biryani with prawns. Biryani cooked with chicken, goat, fish, prawns. Triangular shaped savoury pastry filled with mashed potatoes and spices. Samosa crushed and topped with a blend of chutneys and chat seasoning. Samosa crushed and topped with a blend of chutneys and chat seasonings along with special cooked peas. Boiled eggs dipped in lentil batter and deep fried. Deep fried green chilli dipped in chickpea flour. Deep fried green chilli dipped in chickpea flour and stuffed with spiced onions. Thick vegetable curry fried and served with a soft bread roll. Layer of flat puris topped with a blend of chutneys and chat seasonings. Layer of flat puris topped with a blend of chutneys and chat seasonings along with special cooked peas. Specially cooked peas topped with a blend of chutneys and chat seasonings. Puffed rice mixed with chat ingredients and sauces. Round, hollow puri, fried crisp, served with a mixture of flavoured water, chopped onion and special cooked peas. Round, hollow puri, fried crisp topped with a blend of chutneys and chat seasonings along with special cooked peas. Round, hollow puri, fried crisp topped with a blend of chutneys and chat seasonings. Onion fritters made with gram flour. Deep fried green chilli dipped in chickpea flour and chopped into pieces. Dry milk and cottage cheese dumplings fried and soaked in sugar syrup. Gulab jamun with a scoop of vanilla ice cream. Milk cakes cooked in sugar syrup and milk with saffron, pistachios and kheer.